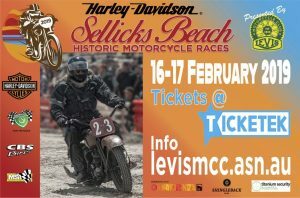 More than 140 bikes and sidecars, built before 1963, have entered next year’s Harley Davidson Sellicks Beach Historic Motorcycle Races which will run over two days, 16-17 February. You can expect to see some classic bikes built by the likes of Adler, AJS, Ariel, BSA, Bultaco, DKW, Douglas, Harley Davidson, Honda, Indian, James, Jap, Levis, Matchless, Norton, Norton Manx, OEC, Rickman ESO, Royal Enfield, Triumph, Velocette, Villiers and Zundapp. 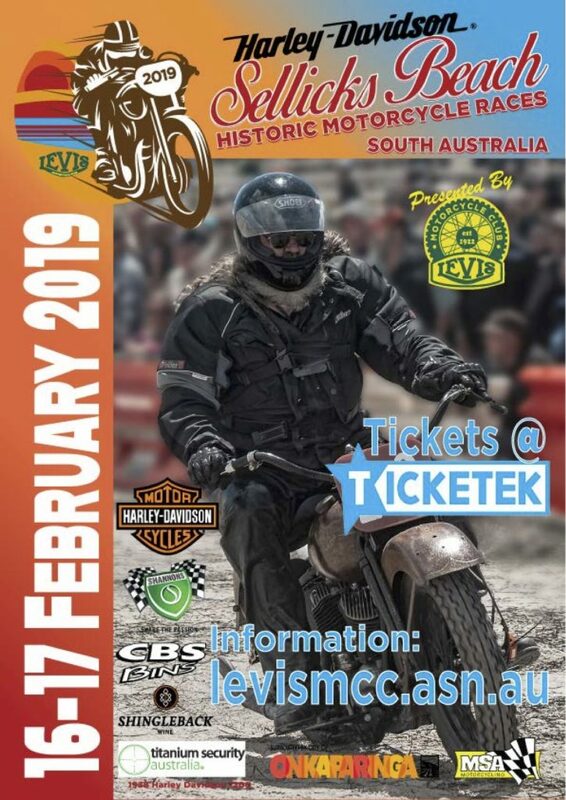 Spokesman, Brenton Matters, says that as the oldest motorcycle club in Australia, The Levis Motorcycle Club (Levis MCC) is pleased to be able to continue a great tradition and work with the local community to present another race meeting at historic Sellicks Beach. Sellicks Beach, 50 km South of Adelaide, with its bed of stabilising pebbles under the sand, became the go to place for speed record attempts from early in the 20th century. In 1922 the owners of the popular Levis (pron. LeViss) two stroke motorcycle formed a Social Club to go on social rides. But many Club members wanted more than just social rides, they wanted to test the power of their state-of-the-art machines and, before long, trips to Sellicks Beach became more frequent. The Australia Day weekend in 1924 saw The Levis Social Club run the first formal race meeting on Sel- licks Beach, a tradition that was to continue for the next 33 years. Because general travel was a lot slower, the 50 km drive to Sellicks Beach meant it became a week- end event, generally on the Australia Day weekend. Naturally, the “Levis Social Club” encouraged the social side of motorcycling (as it still does today). Sellicks was so popular that several motorcycle clubs, including the Harley Davidson Motorcycle Club and Motorcycling Club of SA, built their own clubrooms on the beach. Apart from a break of a few years during the Second World War, the Levis Motorcycle Club ran the event every year through to 1957 and, apart from re-enactments in 1986 and 1992, there was no competitive racing at Sellicks for 60 years. Mr Matters says that all changed in 2017 when, after two years of lobbying and hard work the Levis MCC was given the opportunity to recreate that golden era of motorcycling. Mr Matters says the popularity and success of the event has seen the City of Onkaparinga issue a permit for the race to be run again. He says the Club is working closely with residents, traders and Council to ensure the community ben- efits from the event. “All the catering at the event is being arranged by local traders. The Scouts will be running the car park again for a gold coin donation, the CFS and Surf Lifesaving Club are also involved. “There will be lots to see and do and we are in discussion with some local businesses to provide be- tween race entertainment as well. This year the Club is offering one- and two-day tickets with children under 14yrs admitted free with an adult. Tickets are available through Ticketek. As a condition of the permit, there will be no ticket sales at the gate. Mr Matters says it is great value for two full days of entertainment. “You will not see anything like this anywhere else. 140 Vintage and Veteran motorcycles and riders racing full bore on the beach. “With kids under 14 admitted free, you can bring the family and enjoy a great weekend with some- thing to interest everyone.